The Ronne Antarctic Research Expedition (RARE) was an expedition from 1947–1948 which researched the area surrounding the head of the Weddell Sea in Antarctica. Finn Ronne led the RARE which was the final privately sponsored expedition from the United States and explored and mapped the last unknown coastline on earth and determined that the Weddell Sea and the Ross Sea were not connected. The expedition included Isaac Schlossbach, as second in command, who was to have Cape Schlossbach named after him. 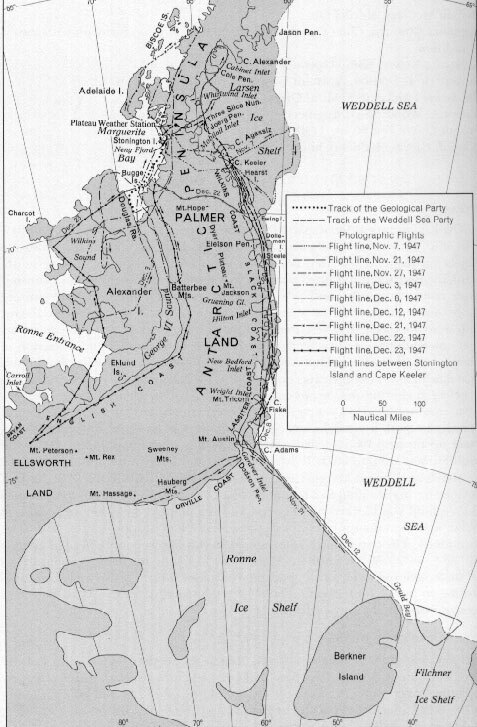 The expedition, based out of Stonington Island was the first to take women to over-winter. Ronne's wife, Edith Ronne was correspondent for the North American Newspaper Alliance for expedition and the chief pilot Darlington took his wife. Bowman Peninsula - Named for Isaiah Bowman, American geographer. ^ "GNIS Detail - Mount Brundage". geonames.usgs.gov. Retrieved 3 April 2018.